For New Yorkers who have divorced from the subway as their main form of commute, a new development in the East Village may better suit their needs. 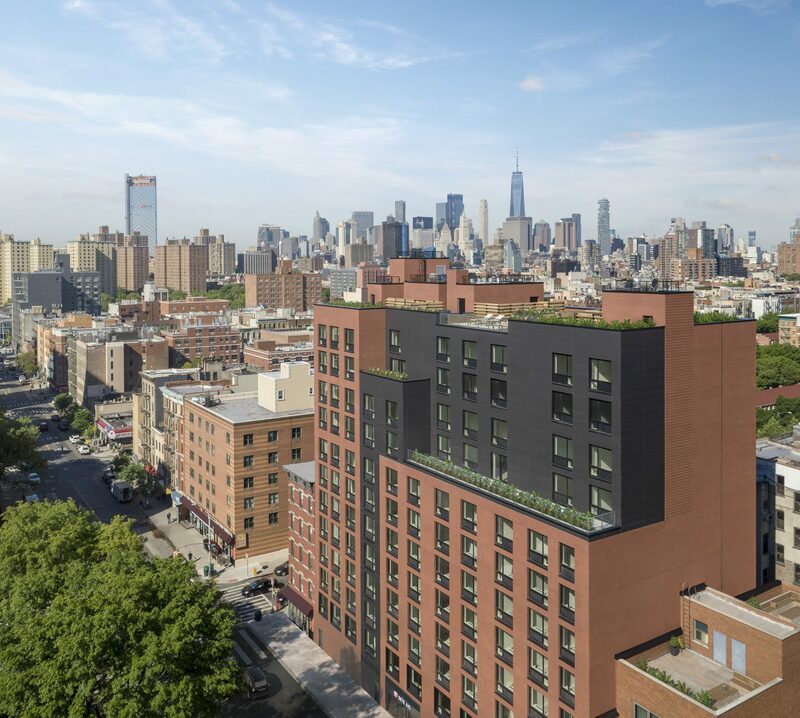 At 751 East 6th Street, the Niko East Village is a 12-story development that is split into 82 market-rate units and 28 affordable housing units. Renters at Niko get a Citi bike membership as part of their rent. Prices for market rate residences include studios starting at $2,800, one-bedrooms for $3,400, two-bedrooms starting at $4,500 and three-bedrooms that start at $6,000. To reflect the artsy neighborhood’s look and feel, developer L+M Development Partners hired architects from GF55. They designed Niko with a red brick exterior to match surrounding buildings and filled the interiors with custom artwork. But to separate Niko from the crowd of new developments in Manhattan, the building is offering a unique transit amenity in its package. The Niko is giving tenants a Citi Bike membership for each resident for the duration of their lease and a $500 gift card that is meant to be used on rideshare services like Uber or Lyft. With two Citi Bike stations on Avenue D at East 6th and East 8th Streets and the proximity to the FDR Drive, tenants aren’t tied to lugging it to the nearby subway stations. On top of the transit bonus, tenants still get the standard stock of amenities, including a part-time attended lobby with concierge services, a second-floor lounge with alcove seating that opens up to a terrace, a fitness center, package room and bike storage. Located at the corner of East 6th Street and Avenue D, the Niko is situated by several train lines all roughly a 15-minute walk away. Tenants can either use the L train’s 1st Ave. stop, the F train’s 2 Ave. stop and the Delancey Street Essex Street stop that has the F, J, M and Z trains. For those not interested in taking the subway, there are also several city buses only a block away, including the M14D, the M9 and M8. Kelman said the Niko was designed to fit into the neighborhood. From the studios to the three-beds, the apartments were designed with oversized windows for maximum sunlight and views of the lively East Village. All the one-, two- and three-bedrooms come equipped with washers and dryers and some units offer walk-in closets. The modern apartment design includes kitchens with quartz countertops and stainless-steel appliances and the bathrooms are a mix of porcelain and ceramic with custom vanities. Four units in Niko have wide private terraces. For those without terraces, residents can head to the top of the building’s rooftop terrace with cabana seating and barbecue areas. The main draw is the Niko’s west-facing panoramic view that spans from the World Trade Center to the Chrysler Building and the east side that looks towards the East River and Brooklyn. And all the way at the ground floor, Rite-Aid is taking the entire 8,000 s/f and is expected to open this month. In addition to private terraces, residents have access to a shared rooftop lounge with tables and cabanas. To add a final touch to fit into the neighborhood, L+M emphasized custom artwork with a sweeping mural in the lobby behind the front desk and colorful wood sculptures created by artist Scott Troxel at every elevator landing. But the biggest selling factor for The Niko is the surrounding area that offers anything a New Yorker would want within walking distance. Residents can walk down to East Houston For Katz’s Deli, or along East 10th Street for Momofuku Noodle Bar. The East Village can offer peace and quiet with its many small parks, or a wild night with its many bars and clubs.